The Indian version of skirt, lehenga is a chic garment. It generally has a number of pleats that sway charmingly when the woman walks. This outfit is immensely preferred for occasions, which involve dancing. It is so because when a woman wearing lehenga dances, the pleats fan out giving her an impressive look. The upper garment is called choli (blouse). It is a closely fitted garment with embroidery and embellishments. Mostly, the choli does not cover the waist. A decorated stole (dupatta/chunni) is worn where it covers the bust and the loose ends go over both shoulders. Because of its rich look, the dress is an all-time favorite of many Indian women. The attire has experienced great evolution over many years. In many villages, women wear lehenga choli on daily basis. Hence, you can be rest assured that the dress would be comfortable for you. Now, by crafting a variety of designs on the fabric, lehengas and cholis are given different looks as per the demands of the occasions. At YOSARI, you can look through the rich range of this outfit and select the one that suits your personality the best. They are the most exclusive of the lot. Each piece is individually designed with immense precision. A designer makes the sketches keeping in mind the occasion and various other aspects. Similarly, the decoration done on the fabric is of superior quality. YOSARI holds a huge collection of such garments for all kinds of celebrations. Wedding is perhaps the most important occasion in a woman’s life. A bridal lehenga choli is designed and decorated is such a way that it makes the bride look exclusive. It makes her super attractive and gorgeous. Go for shopping for the bridal wear at YOSARI. A wedding is the major ceremony that takes place after numerous small ceremonies. As the bride is expected to look ravishing in all of them, YOSARI presents a collection lehengas that could be worn on these occasions. They are highly ornate and they shimmer in lights. These garments are especially designed to be donned in parties of every nature. The costume incorporates a host of colors and many times contrast shades are used to create a totally different look. Here, at YOSARI, we have a brand new range of such garments for women of every age group. How is lehenga choli decorated? There is no limit to the ways this dress could be decorated. You will find embellishments in the form of sequins, beads, pearls, shells, rhinestones, zari, and gota. On many dresses, you will find exquisite threadwork done with silk, cotton, synthetic threads or a combination of all three. Designer and party wear lehenga cholis are the best examples of ornamented attire. In them, you will see a lot of experimentation being done with embellishments as well as with fabric. Beautiful designs on silk, synthetic, net, and cotton all make the costume a breathtaking piece. Find such a garment for yourself here at YOSARI. So many choices…How to choose the perfect lehenga choli? Although there are a multitude of choices, your search for the most gorgeous attire begins and ends at www.yosari.com. Here, you will discover a good selection of lehenga cholis for all ceremonies and festivities. Every piece has been crafted to meet high standards of perfection. Our designers pay special attention to create items that would flatter your silhouette and will highlight your curves in the most graceful way. Keeping in tune with the latest trend, we have cool attire in fishtail designs as well as straight cuts. The fishtail looks really cute as it accentuates the rear perfectly while the straight cut provides a proportionate look to the figure. At YOSARI, we have high resolution images of models wearing the dresses so that you have the perfect idea of how the attire actually looks. Moreover, after selecting a garment, you can customize it for yourself by using our unique size-perfecting tool. Once, you do that, be assured that the dress will reach your doorstep in that exact size. Which lehenga cholis are most in demand? In terms of popularity, Party Wear Lehenga stand first. The reason for their high demand is their versatility and of course, awesome looks. Whether you have a daytime occasion to attention or a late-night party, you will find a host of varieties in this range. 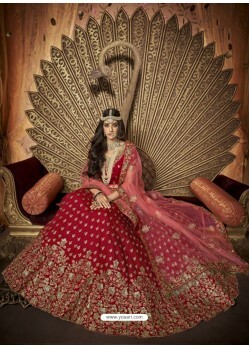 The second is the Designer Lehenga Cholis, which have the exclusivity that many women desire. Perfect for important occasions like wedding anniversaries, baby showers, engagement and so on, in fact, these dresses are perfect for every occasion that has a special place in your heart. Wedding and Bridal lehengas fall in a different category completely. These dresses are made especially for the bride, her sisters, aunts, and friends. In fact, the garments are so scintillating that they make the bride feel on top of the world. yosari.com is equipped with the widest assortment of lehenga -cholis in almost every color that you can imagine. The work done on these dresses are authentic and to perfection. The collection of garments at www.yosari.com is dynamic. Just as the fashion demands, we add new ones to our selection. Therefore, no matter when you visit our website, you will surely get to purchase the most trending attire here. We have 14-day replacement policy, which means you can return the item and get a refund. Furthermore, we ship not only in India but also abroad including US, the UK, Canada and Australia. Wait no more…start shopping!